We decided to visit Bingley to view the famous Five Rise Lock staircase on the Leeds Liverpool canal, which is the steepest in Britain. 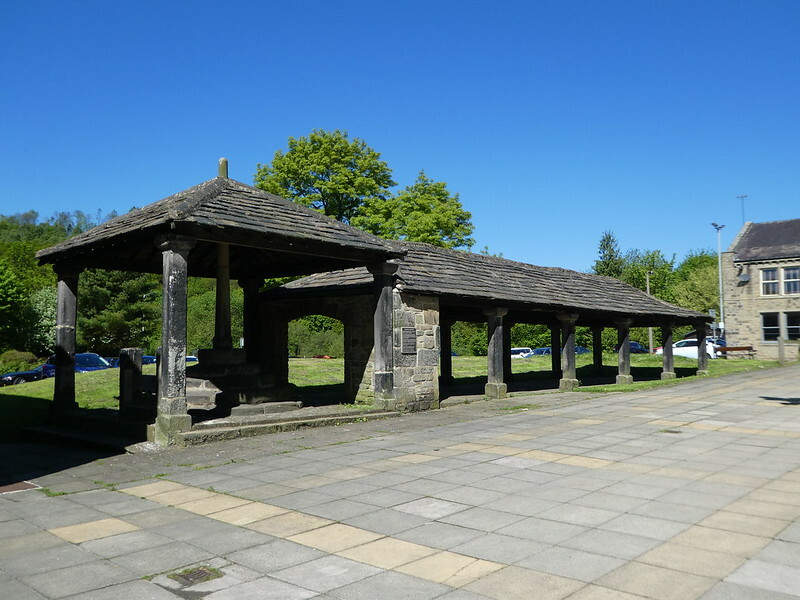 Bingley is located in West Yorkshire and can be accessed by train as Bingley is on the Airedale Line with regular services from Leeds and Bradford. 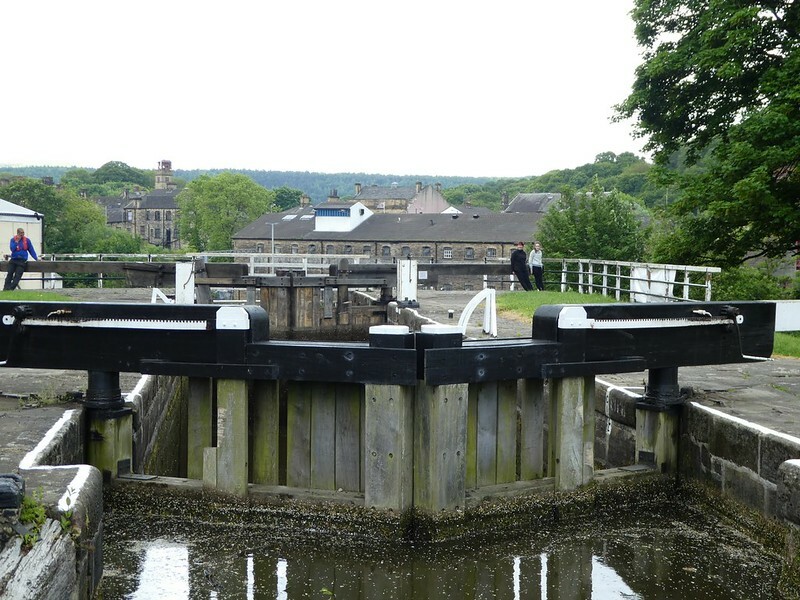 The Locks are approximately half a mile from the town centre just off Beck Lane and street parking is available nearby. The Locks opened in 1774 and rise a total of 60 feet allowing boats to be lifted or lowered in five stages. A lock staircase is where the locks open directly from one to another, meaning that the top gate of one forms the bottom gate of the next. As a boat enters the lock chamber to descend the staircase the water level rises slightly and the excess flows via a channel at each side of the lock. After waiting a short time we were fortunate to be able to see a narrowboat enter the Locks and watch as the water level slowly rises to allow the boat to pass through to the next gate. Because of the difficulty of working a lock staircase and with many boaters being first time handlers who have hired a canal boat for a one or two week holiday, a full-time lock keeper is employed at the Five Rise Locks during daylight hours. We watched him assisting a canal boat entering the lock chamber and helping the boaters with the lock gates. Overnight, the lock gates are padlocked so approaching boats need to find a suitable overnight mooring. As well as watching a boat navigate its way up the lock staircase there was also plenty of wildlife to observe on the water. 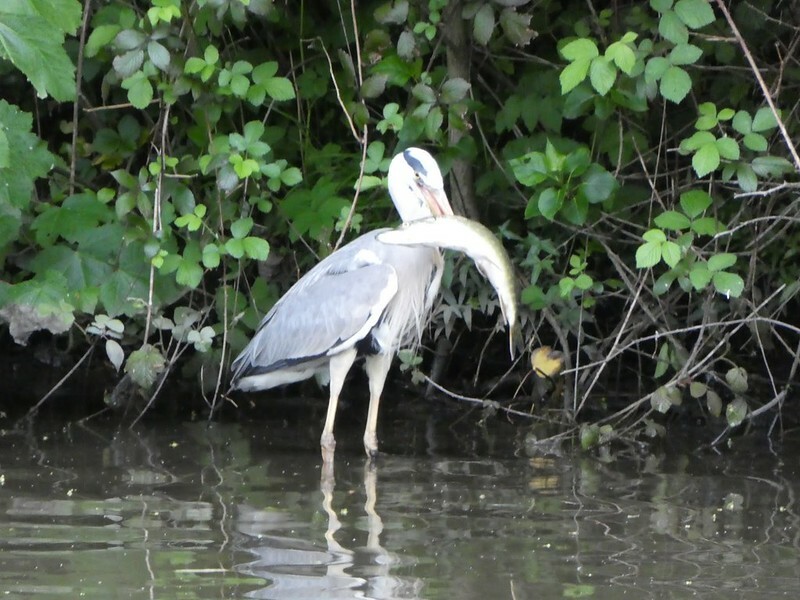 We spotted a goose with goslings, duck and ducklings and this heron who had just caught a huge fish and soon disappeared into the bushes to devour it. At the top of the staircase there are moorings available and a very attractive small cafe, The Five Rise Locks where we enjoyed pots of tea and toasted tea cakes. The cafe is housed in a former stable block and gives a warm welcome to boaters and tourists alike. Before leaving the canal we retraced our steps down the side of the staircase and continued a little further along the towpath until we reached the Three Lock Staircase which has a height of 9 metres (30 feet). Leaving the canal tow path we walked the short distance to the centre of Bingley to explore the town. Crossing the main street we spotted the old market hall and Buttercross constructed in 1753. . Reading the plaque, we learnt that Bingley was first granted its market charter by King John in 1212. The Buttercross was the place where people would come to buy and sell local butter, milk and eggs. Bingley still has an open market but nowadays it is to be found in the refurbished town square each Friday and Saturday. Just behind the Buttercross lies Myrtle Park and from there we enjoyed a short walk along the banks of the River Aire towards Bingley Parish church. 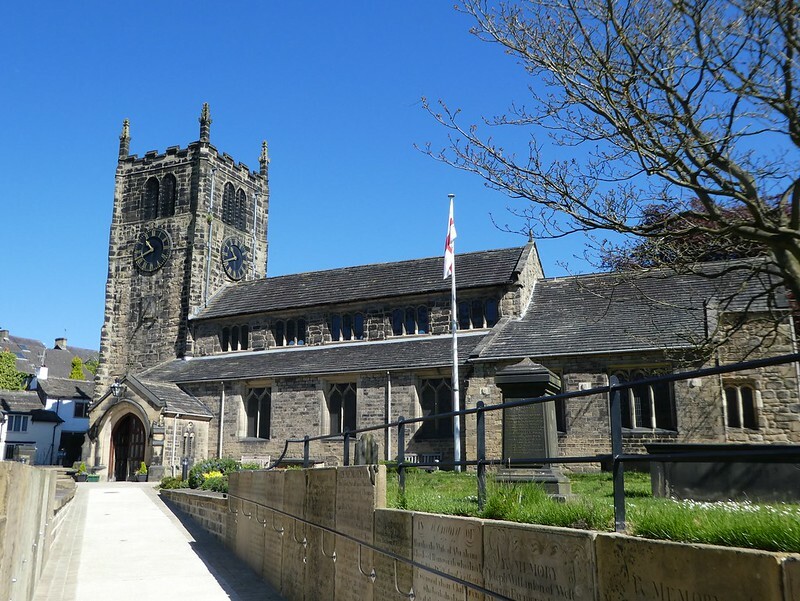 All Saints church dates back to Norman times with the present structure built between 1491-1547. It was interesting to see that a number of the very old gravestones had been moved and re-located into the wall alongside the path leading to the church entrance. This seemed such a sensible idea as so often old tombstones have fallen into disrepair and become hazardous . Completing our tour of Bingley, we passed the whitewashed Old White Horse pub which stands close to the church. 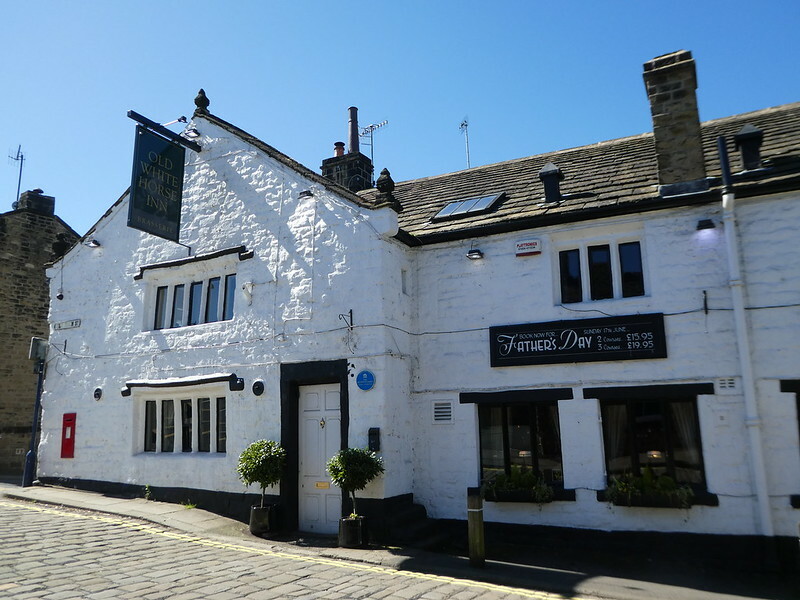 This former coaching inn is thought to be the oldest pub in Bingley and dates back to the mid 17th century although there is evidence that a hostelry has been on this site since 1579. A short walk back up the hill took us to the railway station from where we returned home after a pleasurable day exploring Bingley. That little place is not far from where I grew up. Glad you’ve visited it. Yorkshire is so lovely. Thank you for getting in touch Carole, to so nice to hear from you. 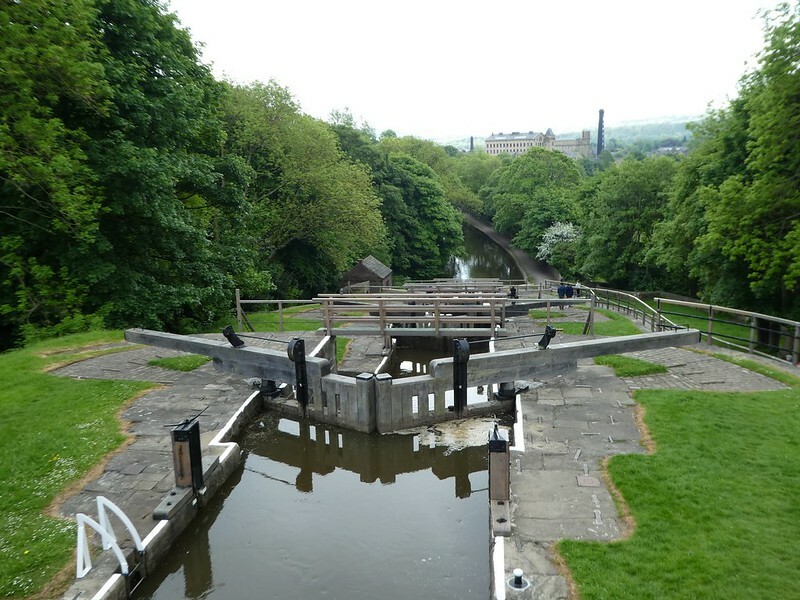 We enjoyed our visit to Bingley and especially the Five Rise lock staircase. I went through these locks many, many years ago on a holiday with my family when I was little. I have such fond memories of it, we loved getting out to do the locks! I was mostly good at dropping things (including myself) into the canal but hey, I thought it was fun. Great post, brought back a lot of memories. Thanks Sarah for your kind words, I’m glad this post brought back some fond memories for you. Thank you, your comments are much appreciated! A very British holiday :- o) thank you, brought back memories of living very near a canal in Congleton, Cheshire. Try an e-book called Narrow Margins by Marie Browne, about a family who had to give up their home in Birmingham, and decided to live on a canal boat, without any experience of narrow boats – true story. 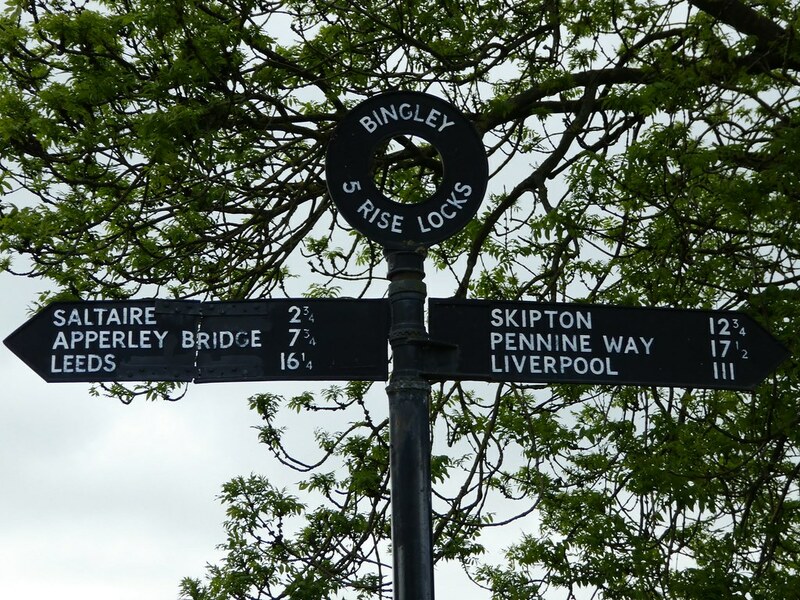 Thank you for your lovely thoughts on the Bingley Five Rise Locks, Cheshire is also very nice. I’ll take a look for that e-book, it sounds interesting. Holy moly, how awesome! This is an amazing thing for me, because I grew up near a hydroelctric dam with a lock! Amazing photos that you captured, it makes you feel like you’re there…thanks for allowing us to take a view into your world! Thanks for your kind words Alana, it’s great to read that you enjoyed this post. Great and interesting post. I love lock canals. In Finland, we have them here and there. I have made once a post in which a cargo ship passes a lock canal. Thank you for taking an interest in this post on the Lock Staircase Matti. Canals are always fascinating to explore. Enjoy the spring sunshine too! Great blog, it’ll be nice if you can check out my blog as well. Thank you for taking an interest in this post and my blog. Of course, I’ll take a look at your’s too! I think you would enjoy a visit to the Five Rise Locks and a pot of tea in the little cafe there Jill. Thanks for your welcome thoughts. Lovely, lovely pictures!! 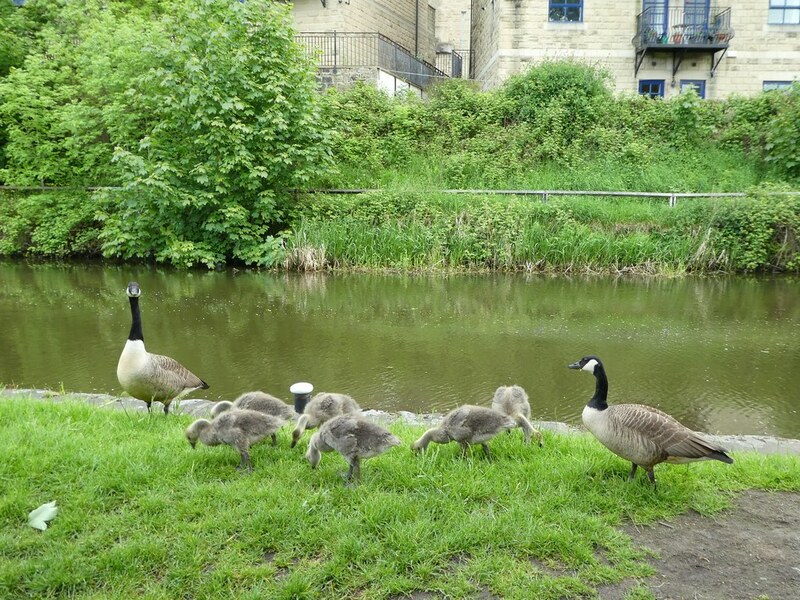 I do have to ask…Are the Canadian Geese in Yorkshire as mean as those we’ve got here in the States? Thank you for taking an interest in this post. Yes, I’m afraid that geese are just the same the world over! Thank you for your thoughts on my post on Bingley, it’s so nice to recall previous visits and such happy memories. I understand what you mean, it is very peaceful and slow moving but you do have to gave a certain amount of skill to be able to manoeuvre the boat and use the ropes effectively. Thank you for taking the time to reflect on this post. I think that being a lock keeper would have been an interesting occupation even back then as cottages were canal side cottages usually provided for them. I find licks fascinating and I wouldn’t mind a relaxing g trip on a canal boat. We just had to cancel a trip to the area… too bad. We could have visited the locks! Sorry you had to cancel your trip to Yorkshire but hope you get an opportunity to rearrange your visit soon. It’s my pleasure Jim, I hope you find time to visit Bingley and some other interesting places in the vicinity such as Skipton and Ilkley. Fascinating! While in the UK a few years ago, my wife and I spent a great deal of time on the wonderful canal tow paths. I fantasized about doing a tour on the water, but after seeing how much work (and skill) was required on Timothy and Prunella’s Great Canal Journeys, I’ve thought I might just rent on where it’s docked! Thanks for the tour and the descriptions. Beautiful pictures. It’s my pleasure Leah. I, too enjoyed watching Timothy and Prunella’s Great Canal Journeys and would love yo take a trip on one of Britain’s canals. Thank you so much for your kind words Charlotte, it’s so nice to read that you find my puss enjoyable. Thanks, I hope you continue to enjoy my posts Charlotte. Great post! A very pleasant place to spend some time. The whole process of using the locks is fascinating. I have seen a number of TV shows from Britain featuring narrow boats and the locks. We visited the Devises a few years ago. A different type I know but so many locks! We loved seeing them up close and we too were fortunate to have narrow boats passing through. So saw them in action! Thanks for sharing! Thanks for your kind words about the Five Rise Locks. I agree that locks and narrow boats hold a fascination. I hope you rake a trip on one before too long. Thank you, canal boats and locks are so fascinating ! This article was very gripping! From your description and pictures this places seems to be so enjoyable and also the system of lock staircases was so interesting. Thank you! Thank you for your kind words. It’s so nice to read you have enjoyed this post on the Five Rise Locks. My sister lives near Bingley, next time I’m in the UK visiting her I must look up the places you mentioned. I have walked the canal and watched the wildlife. Thank you Helena for your interesting thoughts on the Five Rise Locks. I hope you get an opportunity to take a look at them when you are next visiting your sister. What a lovely place to visit. 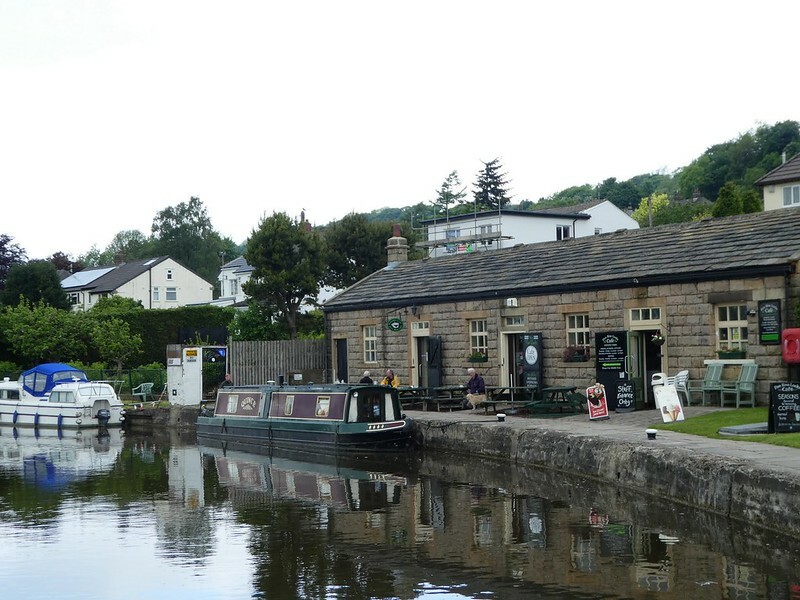 After reading your post I want to visit Bingley and have a nice tea while watching the locks. I am mesmerized by the engineering of locks. That this was built so meant years ago proves one again how marvelous Britain’s were centuries past. Thank you for sharing. Thank you for your kind words. It’s lovely to hear from you. I’m also mesmerised by the engineering of locks and would,I’ve to take a leisurely trip along one of England’s lovely canals. Love a canal and locks, the five rising locks look fascinating. And such a sunny day to take a trip there too, looks great. Thanks Jonno for your kind words. 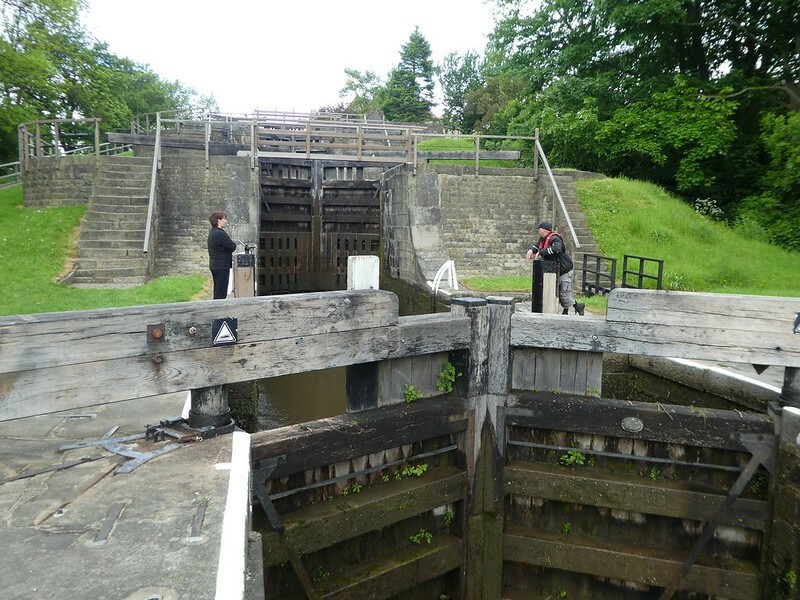 The Five Rise Locks are a feat of engineering and its fascinating to watch boats pass through. Have you ever been to Foxton Locks in Leicestershire? I think there are 10 locks there, it’s so interesting. No, I hadn’t heard of it Jonno but I’m certain that it’s somewhere I would like to visit. Sounds gorgeous, another reason for me to visit the Nuremberg region! I enjoyed reading this, I always find canals and lock gates most interesting. I haven’t been to this part of the country at all. Lovely photos. Thanks for sharing! Thanks Georgie for your kind words. I’d like to take a canal trip in the U.K., surprisingly we’ve only taken canal boat holidays in Northern France so far. What a lovely place, this appears to be! Love The Old White Horse pub. Thanks Coral, that pub must have a lot of stories to tell. When our children were small we hired narrow boasts for one week holidays in northern France. That was great fun and very easy as the French have lock keepers assisting on each lock. I’d like to take a trip in England as well now.